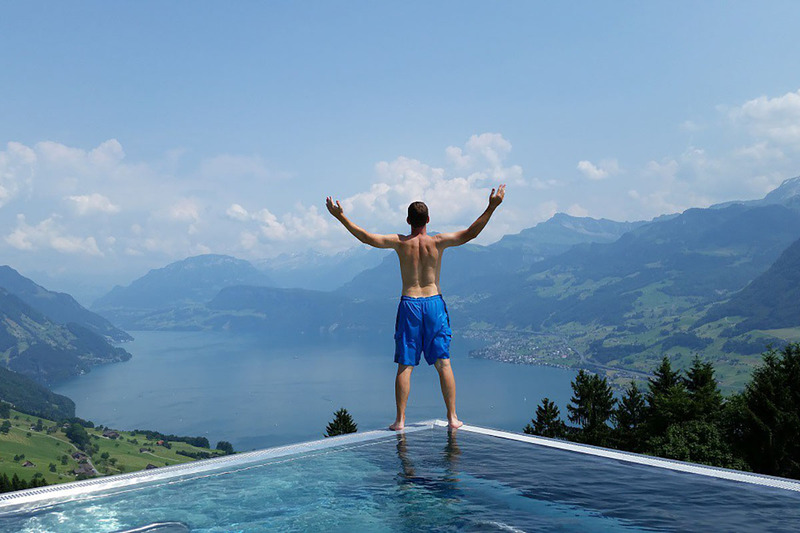 Greg Johnson takes in the view while visiting Lucerne, Switzerland. Courtesy of Club Thrifty. Up until 2011, my husband and I worked long, difficult hours in traditional office jobs. We had two kids, a house and everything we could want – that is, everything except time. While we enjoyed a comfortable lifestyle, our lives felt hurried. If we weren’t at work, we were getting ready for work, doing chores or taking care of our kids. We only had 15 vacation days to burn each year – not nearly enough to account for sick days and to travel the way we wanted. Fast forward to 2017 — we now travel the world around 12 weeks of the year. We bring our kids around half the time, and leave them at home the rest so they can stay in school. This year alone, we will have traveled to Jamaica, Ireland, Germany, Italy, Switzerland, Aruba, Bora Bora, the Dominican Republic, Spain and France. How did we get here? We started our own online business – ClubThrifty.com – in 2011 and worked tirelessly until we could work for ourselves and travel at our leisure. Of course, traveling with kids in tow isn’t cheap, nor is exploring far-flung corners of the world. We’ve learned to lean on savings strategies that make travel less expensive and more realistic for our budget. If you’re looking for a smart way to save money on airfare, there is no greater tool than Google’s ITA Matrix software. This page makes it easy to search for the cheapest flights on any airline and from any airport. Check for deals by date, departure airport and destination to find cheap routes you can’t always find on the web. Once you find a deal on the ITA Matrix, you can head directly to the air carrier’s website to book directly. To save money when we travel to big cities abroad, we rely on city passes for sightseeing. With a city pass in destinations like Rome, New York City or Paris, you can see most of the top attractions for a single low price. Sightseeing passes not only help you save money, they are also convenient. Many also let you “skip the line” at top attractions, letting you save both money and time. Travel credit cards help you earn free airfare, free hotel stays and other travel perks. We’ve had anywhere from 12 to 40 cards for years, mostly so we could leverage their rewards and benefits to score free and discount travel across the globe. While we pay for a lot of travel out-of-pocket, we use credit card rewards to stretch our travel budget and travel further than we may be able otherwise. Earlier this summer, for example, we used airline miles to take our kids to Italy and Switzerland for two weeks. Instead of paying $1,800 per flight, we used 50,000 Air France/Flying Blue miles and paid $90 per person. To earn more rewards over time, we have also learned to get pretty creative. We not only sign up for new cards to maximize signup bonuses but also strategize spending based on bonus categories and take advantage of loopholes (like paying our mortgage with a credit card) to boost our reward balances. Websites like TheFlightDeal.com and SecretFlying.com bring short-term travel deals to light every day. If you pay attention – and if you can strike while the iron is hot – you can score amazing deals to destinations around the globe. Recently, we spotted a sale on TheFlightDeal.com and booked round-trip tickets to Madrid from Indianapolis and home from Paris for less than $400 per person – that’s how much we would normally pay for a domestic, round-trip ticket. Deals like this are available all the time, but you have to watch out and pay attention — most top travel deals are only available for a day or a few hours, rewarding those who are always on the lookout. Whether you’re using points and miles or cash to book hotels or airfare, traveling off-peak has its benefits. If you can travel to the Caribbean during fall or Europe from May through October, for example, you can book airfare and hotels for up to 40% off. Instead of deciding where we want to go and figuring out how to save, we choose a “deal-planning” approach to travel instead. With this strategy, we decide where to go based on the amazing travel deals we find – not the other way around. By planning around deals, you can save more money and see new places all the time. Some of our family travels are the “all-inclusive” kind where your hotel, food, drink and entertainment are all included. While these trips aren’t big learning experiences, they offer the perfect opportunity to relax and unwind. While we love all-inclusive resorts, we also love cruising. Not only are cruises a great way to save money, but they make it easy to see several different destinations in a single trip. This winter, for example, we’re cruising with MSC Cruises out of Miami with stops in Puerto Rico, Barbados, Bahamas, Antigua, Tortola, Grenada and Jamaica. The cruise fare includes food and entertainment, and kids 11 and under cruise free on select itineraries. One way we consistently save money is by booking the least desirable flights – usually early mornings – for our trips. If you’re willing to fly first thing at 5:00 a.m.or 6:00 a.m., you may be able to save up to 20% off airfare. As an added bonus, you can avoid huge lines at the airport. While hotels offer an affordable way to stay just about anywhere, they aren’t always conducive to family travel. Average hotel rooms are small, and they don’t have common areas where you can relax and hang out. So, we almost always book vacation condos or AirBNB.com rentals when we travel with the kids. We get more room to spread out, and rates are typically cheaper. We also have room to make some of our meals for even more savings. Once we started traveling internationally more than a few times per year, we realized we could save money by switching cell phone carriers. Last year, we switched to T-Mobile One service, which grants free data in more than 140 countries worldwide. This allowed us to save money since our new unlimited plans were only $50 each and we no longer had to purchase expensive SIM cards to use abroad. While we still spend plenty of money on travel every year, these ten tips have helped whittle our spending down to a figure we’re comfortable with. And with enough savings strategies on our side, we have been able to travel further and stay in each place longer. If you’re looking for a way to see the world without spending a fortune, these tips can make your travel dreams come true. With some planning and out-of-the-box thinking, you could be seeing the world’s most famous — and most breathtaking — sights in no time. Holly Johnson is a financial expert and award-winning writer for well-known publications such as U.S. News and World Report Travel, Personal Capital, Lending Tree, and Frugal Travel Guy. Holly owns two websites, Club Thrifty and Travel Blue Book. She is the co-author of Zero Down Your Debt: Reclaim Your Income and Build a Life You’ll Love. You can follow her on Twitter or Pinterest @ClubThrifty.